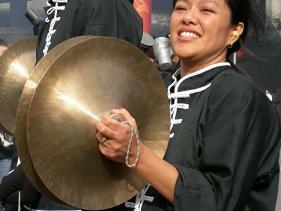 The Chinese cymbal (or "china") comes from immemorial times and was integrated from the beginning into the modern drumset (imported from China, they had a prominent central dome, to take them in hand (see photo below)) but fell little into disuse with the advent of the "splash" cymbal in the 1930s. 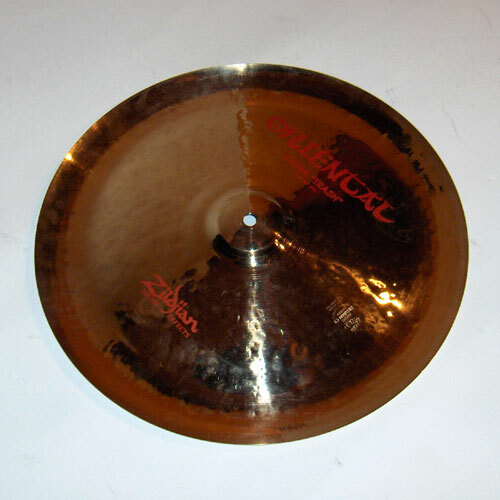 This is a cymbal which edges are curved, which increases its speed of crash and resonance. We find it today in all kinds of size and finish (from 10 to 22'' in diameter). A bit like the "splashes", the Chinese cymbal can be almost only played in saturation, but its exceptional speed of extinction of its resonance, allows it to be played distinctively for "riding". The sound resulting is dark, dull, dry and powerful, "explosive", highly appreciated by Jazz-Rock and Metal drummers, who love the expression of violence. One of the first to have popularized it (again) was Billy Cobham in the 1970s by playing upside down, with the shaft on the edge (this method is usual now for not damaging the stick with the curved edge of the cymbal, but the first drummers who were already using Chinese imported from China, used on right side (dome up) and sometimes with rivets). Al Foster is also a big fan of this cymbal, which he uses like a ride, with "pings". Today, many drummers in all styles have adopted it to give a very brutal accent, especially in amplified and Electric music. Dave Weckl popularized in the 1980s, the playing of Chinese cymbal combined with a crash (the Chinese cymbal being set on the right side on a crash) which gives a more muffled and resonant sound of Chinese (by combining the qualities of the two cymbals quoted here). 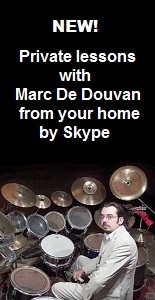 Finally I want to talk about Terry Bozzio , who constitutes a whole set of Chinese cymbals (not less than 14! ), but thicker than traditional models and partially chiselled (which he did make especially for him (by brand Sabian, "Radia" model)), to play it as a tuned keyboard.